Eli Yishai says he never had any doubts that his Yachad - Ha'am Itanu party could and would pass the threshold into the Knesset on its own, and insists his decision to run together with the Otzma Yehudit party was made purely to prevent the Right losing "50-60,000 votes." 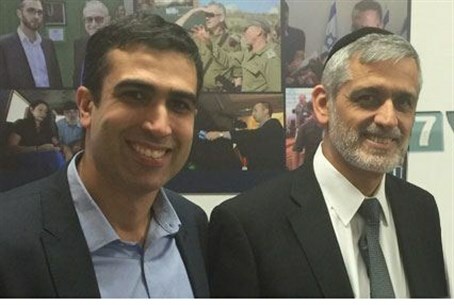 Yishai made the claim during a visit to Arutz Sheva's offices in Bet El, where he met with staff together with his number two MK Yoni Chetboun. The former Shas leader stated that his entire political journey since leaving the Sephardic-haredi party late last year has been a carefully considered one, and that at one point he thought about simply leaving politics altogether. "I thought long and hard" about splitting and forming a new party, he emphasized, "the easier thing to do would have been to simply leave political life, at least temporarily - that's all the rage now," he quipped, referring to a growing list of politicians either taking a break from politics or - like Moshe Kahlon - returning after a hiatus. But he says he decided to establish the Ha'am Itanu party after realizing the demand for such a party among certain sectors of the haredi, religious-Zionist and "traditional" Sephardic public. "There has always been this feeling among the religious public of 'why can't we all unite?' Shas, UTJ, Jewish Home... But of course the differences between the political parties in practice are too big to bridge," Yishai explained. "However, we felt that public desire, to unite the knitted kippot and the black kippot." "I saw that during the last government, as a result of all that happened, a huge rift was opening between the national-religious and haredi public," he continued, referring to controversial measures such as the new law to enlist haredi yeshiva students into the IDF. His party, he pledged, would act as the bridge between the different religious camps. It was for that reason as well, he adds, that his party is not engaging in any negative campaigning. "Some people were telling me 'You need to attack someone - Likud, Shas, whoever'; but that's not how we are doing things." Asked about the numerous threats to his physical safety received after defying Shas chairman Aryeh Deri and leaving the party, Yishai said he feels totally safe. The threats, he said, ended "a while ago already." "I walk around haredi neighborhoods freely, and I actually receive a lot of positive responses from people." As for the decision to run as a "technical bloc" with Otzma Yehudit, Yishai insisted that despite most polls showing his party would narrowly miss the threshold without it, Ha'am Itanu would in fact have passed "with spare change." "At one point they were predicting Shas to get around 11 seats, now 3 or 4 at least have disappeared. "Some left to the Likud, some to Jewish Home, some to Kahlon - but for the most part they are floating, looking for a home." Most of those votes would go to him he says, and, together with those elements of the hardal (haredi-Zionist public) represented by Chetboun's constituency, would have easily taken him into the next Knesset even without the technical bloc. Instead, Yishai insists, his motivation was to avoid a "repeat of Oslo." "We remember what happened back then," he recalled. "Tehiya stood alone and they missed the threshold, the Right lost two seats as a result and many posit that is the reason Oslo passed. "We won't let that happen."